I wonder how many records it takes to constitute a genre? 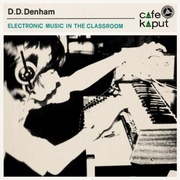 D. D. Denham's Electronic Music in the Classroom is maybe surprisingly not the first abstract electronic long player to aid the physical and philosophical development of children. It confidently takes its place in a small but highly auspicious canon alongside (Radiophonic Workshop founder) Daphne Oram's Listen, Move and Dance and the perplexing and entirely magical Blanche Neige by Jacques Lejeune (lovingly restored by the extraordinary Creel Pone label). It is also the debut release of the (currently download-only) Café Kaput label (a haven for Jon Brooks' (Advisory Circle, King of Woolworths) stranger sounds and Ian 'Moon Wiring Club' Hodgson's brilliant visual leanings. That's quite a calibre. Anyway, back to the mysterious Denham. Our composer/ facilitator/ spirit-host shares the same initials as one Delia Derbyshire (a teacher cousin maybe?) and that's an excellent pointer as to the sounds wrapped inside the authentic Stockhausen Primary School sleeve (all graphic elements will be handled by Ian 'Moon Wiring Club' Hodgson). D. D. Denham and pupils favour a huge bank of analogue electronic sound-devices married to compositional practices that run the full electronic gamut from brittle concrete through squelchy Carpenteresque synth to abandoned space-station ambience, sometimes all in the same piece. Inventiveness is high, post-modern irony non-existent. 'In the Beginning' opens the door- stone tape cameras rolling through empty corridors searching for signs of (school) life while huge crashes disrupt the curious ambience. '1,2,3,4' definitely comes from the chemistry lab though as pulses and tones bubble away with innocent utility whilst a muffled voice from what seems like another century intones the title. 'He's Got Something' is where Denham and company magnificently lose the plot with a frenetic mix of Casio bossa nova, wild playful piano and a frazzled electronic cat. 'Above The Clouds' and 'Two Teeth Missing' is the closest we come to Advisory Circle territory- the former with a jaunty repetitious melody and the latter with thickly textured synths and both as wide-eyed as they are curious. At some points Denham can push you in to more disturbing realms ('Come to Greta' and really creepy 'The Way the Vicar Smiles' with it's hall-of-mirrors droney atmospherics and Solaris-like dubby refractions) but even then, there is childlike innocence in the darkness - a sense of wonder in a world where boundaries between the natural and supernatural break down, no matter how eerie that may (sometimes) get. Brooks and Hodgson have put together a package that has an extremely deceptive lightness-of touch. For all the conceptual subtleties, this is beautifully strange trippy music and it makes you feel... weird. It distorts reality and drags you in to its funny little fictitious world but the after effects refract back in to your own world - Electronic Music in the Classroom is the sonic equivalent of the antique mirror in Ealing's classic Dead of Night, merging reality and reflection to the point of absolute confusion. Of course it goes without saying that geography and a sense of place are intrinsic to the purveyors of those critically associated (for better or worse) with the hauntology genre but blow me if you don't find yourself sat in these curious classrooms, participating in the creation of these odd sounds. And something strange bubbles underneath. The (ever-diminishing) utopian ideal of schooling is in the acquisition of knowledge, of experiment and play whilst seeking to unfold of the world around you - education as a mesmerising spell. Electronic Music In The Classroom: so much of the history of electronic exploration acts as a blissful antidote to the rock 'n' roll cliché – some of the greatest musical journeys played out in arts labs in educational institutions across the world. Electronic it may be but it's a several spiritual dimensions away from the dance floor and most IDM. The better artists in this orbit have been forging strange new worlds from odd fragments of the past in relative obscurity for almost a decade now. Cafe Kaput have begun operations in a beautiful, fun and understated way, carefully constructing their own niche exactly as you would expect from the minds involved. But don't for a minute underestimate the power of this listening experience. Since Advisory Circle's Mind How You Go, Jon Brooks is producing some of the finest electronic music since late-period Coil and THAT is not a comparison i throw around with anything other than the heaviest weight.